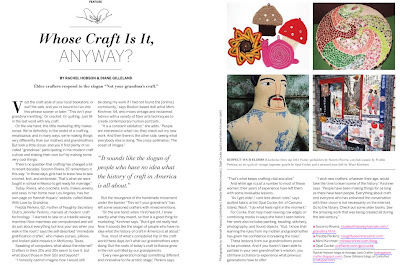 Earlier today, I posted about fun ways to give the gift of a subscription to CRAFT magazine over on the Craftzine blog. I used ink jet shrink plastic to create a fun, glittery version of the downloadable gift cards you can give when you order a subscription for someone. It was really fun to make and would be even more fun to give! I just got word from the CRAFT Subscription team that they are offering an awesome deal for current subscribers: renew your subscription now (for just $34.95) and you can get a gift subscription for F-R-E-E.
OK - so go grab your latest issue of CRAFT and skedattle on over to the CRAFT web site where you'll put in your account number (found on the address portion of your magazine) and you can then renew your subscription and order another subscription - FOR FREE - for someone else. 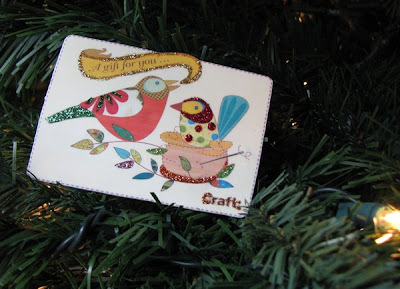 The CRAFT folks will even send the recipient an email about the gift if you aren't going to see them in person to give them one of the printable gift cards. That's an a-m-a-z-i-n-g deal, and if you have a current sub to CRAFT, you are nutso cuckoo not to take advantage. 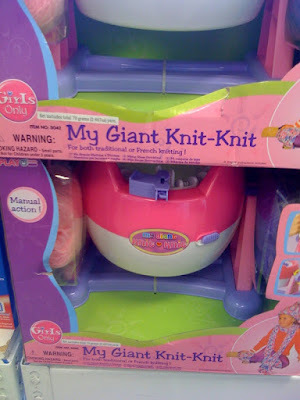 Make your crafty friends and family all kinds of giddy! Go! Now! Do it! Here's a little indulgence I allowed myself as an early Christmas gift. I spotted this Stitchopoly game at Hobby Lobby a couple of weeks ago. When it first caught my eye, I kinda thought, "Oh, ha! Lookie there - it's Monopoly but for stitchers. Cute." the unbelievably awesome game pieces that are teeny DMC goodies. I immediately stashed it in my cart. It was the only one on the shelf, I'd never seen it before, and I figured I could at least walk around with it for a while before I decided if I would splurge and get it for myself. I thought about putting it back and dropping hints to my husband, but then I realized that a) he probably wouldn't get the hints or b) if he did get the hints, the game might not be there when he went back. I decided not to risk it and went ahead and brought it home. One of my best creative pals here in Austin is an amazing artist named Curlin Reed Sullivan. I first met Curlin several years ago through a mom-entrepreneur group here in Austin, and was instantly smitten. You know when you meet those folks who just spark your insides and you know in a second that you connect and you hope to find anyway you can to work together? That's how it was with Curlin. She just makes me smile. After semi-stalking Curlin from a distance, I finally got to spend time with her back in Septemeber during Kat's Surface Design Crash Course. It was one of those random twists of events that landed us both in the class together, and it was a fabulous week of fun times that left us inspired and ready to make fun stuff. 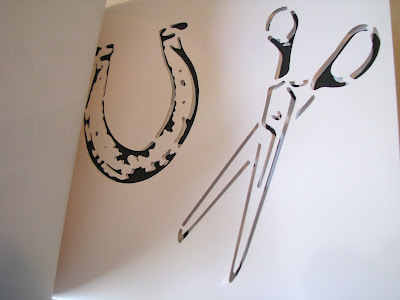 Curlin's work is whimsical and fresh ... literally. 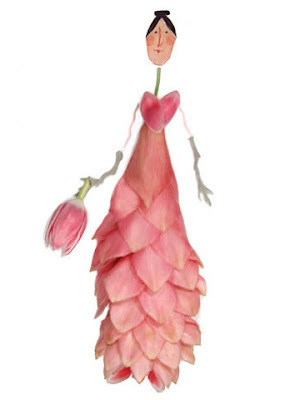 Most of her work consists of using gorgeous botanicals combined with her simple illustrations. I've always loved her style, and top that with her hilarious, witty writing and you've got some seriously good stuff going on. So when Curlin pulled her first screen print back in September of one of her illustrated ladies with a hat exploding with flowers, the first thing that came to mind was "I MUST EMBROIDER THAT!" We started talking about how great her designs would be for incorporating embroidery, and as you can imagine - with a room full of creative minds - a new collaborative project was born. Laurie Wisbrun of Scarlet Fig, Leslie Bonnell of the Stich Lab, Kat McTee of Studio 1408 and myslef all contributed in some small way to Curlin's latest project: Hand Embroidery Kits! You can imagine how giddy this makes me. Of course, anything relating to embroidery makes me happy, but seeing so many great creative women sharing ideas to bring the project to fruition was the best part of all of it. Curlin was the supreme force behind making all this happen. She was kind enough to let the rest of us join along in the fun. 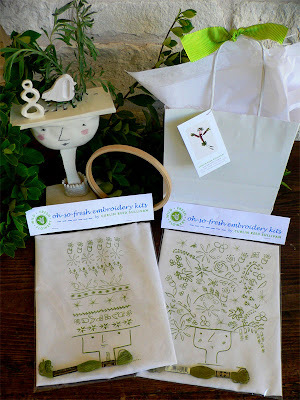 She created the images and lovingly hand screen printed them on to yummy linen blend fabric (in a gorgeous chartreuse color) and packaged them up with all the things someone would need to be able to sit down and get to stitchin'. She's got a glorious lady whose hat literally explodes with flowers, and a dapper gentleman whose flower hat is under a wee bit more control. They make a divine pair. That's a 10" hoop there, folks! The greatest thing about the prints is that they stitch beautifully, and there is room for all kinds of variation. You can stitch solid directly on all the designs, leave some unstitched, leave just the leaves/vines showing, or stitch extra bits in between the printed designs. The options are endless. 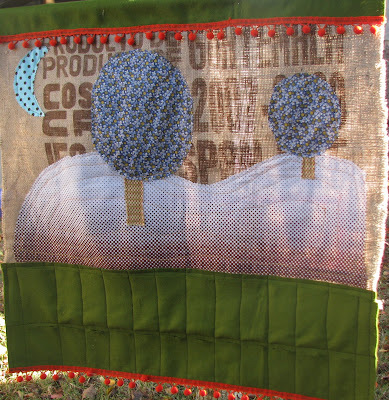 Once you're done stitching, you can frame the piece or make it in to something gorgeous like a pillow or center piece to a quilt. 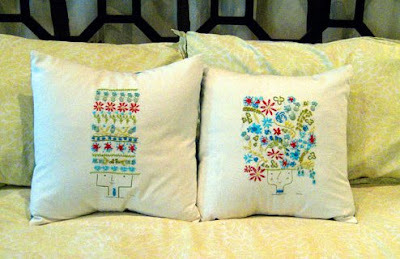 Curlin's pair, stitched by Laurie of Scarlet Fig and sewn into pillows! I couldn't be more proud to have had just a teeny part in all this, and I hope that Curlin's work inspires you as much as it has inspired me. She's the kinda lady who just makes you happy hearing her name. :) Spread the love! One of Austin's most eclectic and beloved neighborhoods, Bouldin Creek, is home to an incredible group of artists, designers, jewelry makers and crafters. 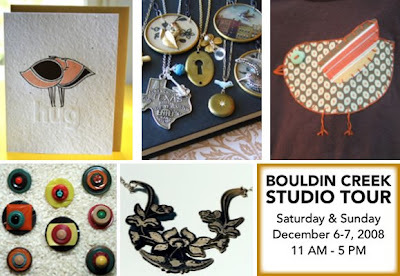 This weekend, Austinites have the opportunity to visit the artists' studios during the Bouldin Creek Studio Tour. I'll be with Leslie Bonnell of Glitzkrieg at the Stitch Lab Sewing Studio on Saturday from 1:00 - 3:00 PM doing free embroidery demos. Leslie will have all her awesome jewelry and sewing class information on hand. Also at the Stitch Lab will be designer, Jody Haller, of One-Eared Cat, showcasing her adorable appliqued kids clothes. The tour also includes studios ranging from letterpress art to photography to found object jewelry design. The Bouldin Creek neighborhood is a super-friendly, fun neighborhood, and well worth the visit. And while you're there, be sure to stop by Thai Fresh - amazing, amazing, amazing Thai food and grocery. Y-U-M. Check out the web site for more information and a handy map of all the artists' studios! 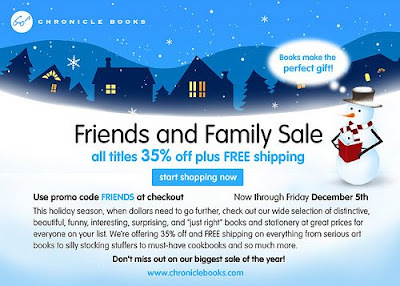 The lovely folks over at Chronicle Books have sent several craft book selections for me to review, and I thought this would be the perfect week to catch up on some of those reviews so you can take advantage of the Chronicle Friends and Family sale that is going on through Friday. All titles are a rockin' 35% off with FREE shipping. Huzzah! I'm doing some quickie reviews of several of my favorites below, and I have an additional list of top picks (some that I've previously reviewed, so they are linked below) of ones to definitely check out. 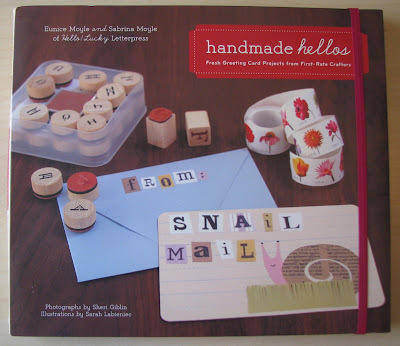 Handmade Hellos is a seriously dreamy book that evokes oohs and aahs with every page turn. 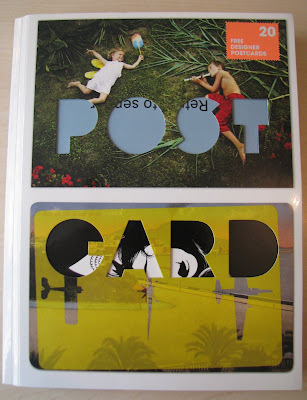 There are correspondence projects from super easy to more complicated, and each one would be well-received. 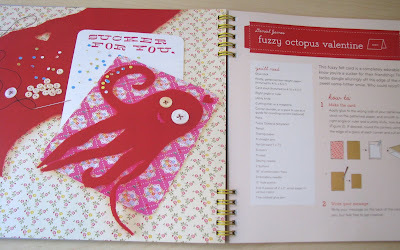 I love the simple silk screen technique they use (embroidery hoop/screen fabric/mod podge) on the Wood You Be Mine project, and I especially love the Sucker For You octopus valentine. Like several Chronicle books, Handmade Hellos comes complete with a fat stack of templates and patterns tucked into a handy back pocket in the (fabulously spiral-bound) book. It's a perfect catalyst for hopping off the computer and creating some truly memorable pieces of mail. Several months ago, my cousin sent an email asking if I knew of any "cool stencils" that she could use for decorating her new office furniture. She was frustrated, because everything she'd found in craft stores was along the lines of grape vines and curly letters. I started digging around on the Internet and found Ed Roth's Stencil 1 web site and instantly sent her the link. Shortly after that, I stumbled on his videos from the Martha Stewart show. 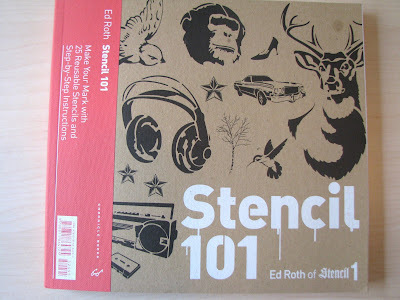 And shortly after that, the Stencil 101 book arrived on my doorstep. Since then, I've been fully enthralled with all the cool applications of Ed Roth's stencils. So get over to the Chronicle site TODAY or by tomorrow so you can take advantage of the super Friends and Family deal of $35% off and FREE shipping. 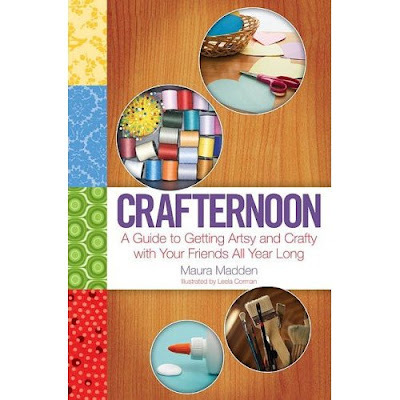 Knock off all the gifts for your crafty friends, or go ahead and gift yourself all the titles you've been wanting. *Of course, when I showed the t-shirt to my son, he asked, "What is that?" and I said, "A cassette tape!" and he said, "Uh ... what's a cassette tape?" Niiiice. Hoorah for count-down calendars! I don't know why I love them so much, and I don't know why I don't find a way to use them in every month of the year (or for any special occasion). Since we celebrate Christmas in our house, we do advent calendars, and I have to admit it's just about my favorite part of the holiday festivities. Last year, I was fully inspired by and in awe of Diane's post about the advent calendar her mother made for her when she was two years old. It's amazing - I mean, check out that giant gold ric-rac. Doesn't get much better than that, folks. 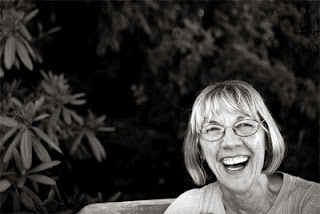 Her mom has posted about the calendar on her own blog (yeah, Diane's mom has a blog. How cool is that!?) and it's so cool to see the original magazine clipping that inspired her calendar. I was dead set to make our own advent calendar this year. We have several advent calendars in the house, but not one was handmade by me. 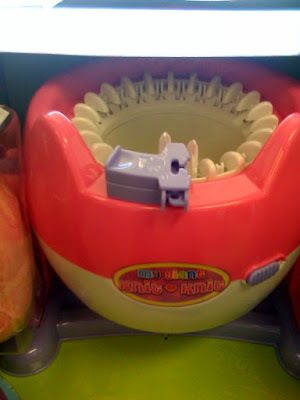 Horrifying, I know. I wrote about my advent calendar class with the Future Craft Collective gals a few weeks ago, and I'm happy to report that I've just about finished up the project! Just in the nick of time! I'm pretty happy with the results. It's not exactly what I had in mind, but given the fact that I had no real "plans" for the project and just dove in willy nilly, grabbing fabrics, sewing with whatever thread was on the machine I happened to sit down in front of, not really measuring or marking as I went, I don't think it turned out half bad! It was a very freeform project, and that's one of my very favorite kind. 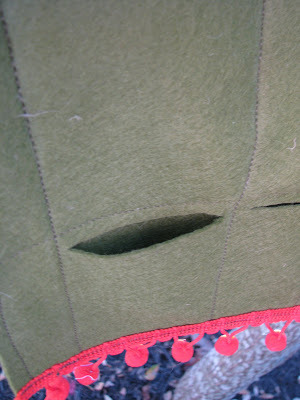 In retrospect, I wish I'd paid attention to alignment just a little bit more, and I wish I'd factored in a little more time so I could make two rows of true pockets. What I ended up doing what just folding the length of felt, stitching all the pockets and then ripped the openings for the bottom row of pockets with some wee scissors. It was an idea we came up with in the class to save time (which it did) but I'm not sure I'm just in love with the results. I was thinking I wouldn't add numbers to the pockets. The examples in the class didn't have numbers, and I actually liked that - so the kids can pick from any pocket and be surprised. Design-wise, though, I think it needs the numbers to balance out that biiiiiiiig space of green there at the bottom. As for trinkets for the pockets, for this year, at least, we are going with buttons. most in white (for snowflakes) and some in yellow (for stars). I let my daughter pick those out from my giant bag o' buttons, and she had fun doing that. UPDATED to add - Kami (fellow classmate and all-around Austin parenting guru ;) posted her calendar on her blog, Get Your Mess On. She's the one with the He-Man bits! Go check it out! For the E.A.S.T. - fun times with a demo from Kat! First up is the East Austin Studio Tour this weekend. I love studio tours, because you get the chance to visit several artists in one day and get a taste of what they do. This Saturday, I'll be volunteering for a few hours at Studio 1408 (I'd ramble on about how much I love this place, but I think I'm bordering on stalker with them) and reading the schedule of stuff the gals are going to be doing at the studio makes me wish I could stay there all day ... both days. 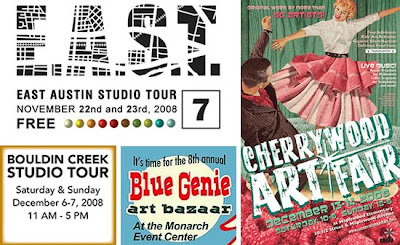 I'm posting the Studio 1408 schedule below (including a repeat of their crazy popular Obamarama screen printing...) , but first I want to mention some other hot spots you'll want to hit - or check out virtually if you aren't in Austin. Jenifer Nakatsu Arntson - Jen's vinyl bags and wallets are uber cool and crazy kinds of sturdy. I treated myself to one of her wristlets several months ago and freaking love it. Amy Barber | Sweettooth Bags with special guests Vanessa Crook, Felice House, Hope Perkins and Jennifer Perkins - That's a whole buncha cool for one stop on the tour. Dang! Arthur Simone - Adrienne clued me in to this artist's work, and it's very cool - layered and all kinds of abstract - interesting stuff. 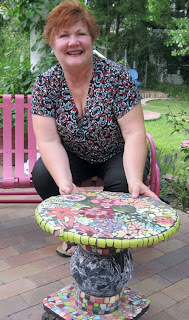 Adaptive Reuse | Christine Terrell - Christine's stuff is awesome, and she is super sweet. She'll be at Studio 1408 and will have a jewlery demo/project for visitors. OK - way too many. I've just spent an hour browsing the E.A.S.T. website and I'm only down to the Es .... ack! Be sure to head out this weekend, and if you aren't here in Austin, browse the list of participants and their web sites - there's some amazing stuff in there. Makes me very happy to live in Austin. STUDIO 1408 (#143 on the EAST map) is excited to be part of this year's East Austin Studio Tour. Kathleen McTee is an artist working with textiles. Her current series incorporates upcycled cloth patterned with screenprinting, dye and obsessive hand stitching, with imagery inspired by the lost roadside landscapes of the American West. During E.A.S.T., she'll demonstrate some of the techniques she teaches in classes at Studio 1408, including screenprinting, stitching and dyeing. Theresa Noyes is a mixed media artist currently experimenting in 3D. She employs unrefined, raw materials such as seeds, hand-dyed jute, and buckwheat for small sculptures and installation. She will have several example of works in progress at Studio 1408, and an installation at Fisterra Studios (Stop 16). In addition to showcasing our work, we have several dye, print and stitch demos scheduled (see below), as well as D.I.Y. opportunities ongoing throughout the weekend. To top it all off, OBAMARAMA is BARACK on! Bring a shirt (or skirt, pillowcase, sheet, whatever) to the studio any time before 2pm on Sunday, and have our future president's face printed on it. The screening rodeo starts at 2 sharp, so no stragglers. Pick up your Obama'ed item at the studio by 5 on Sunday. Cost is just $10. 11:00 am Stamp Making: Learn how to make stamps out of found objects and unusual materials, then create patterns on paper and fabric. Simple techniques, complex results! 2:00 pm Low Water Immersion Dyeing: Fiber-reactive procion dyes are vibrant, colorfast and safe to use. 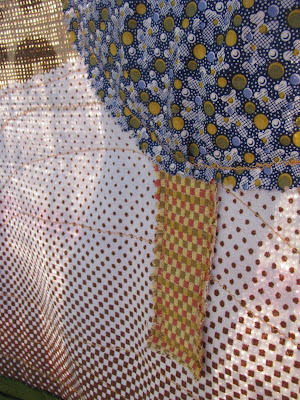 We'll demonstrate how to conserve water while creating brilliant (and subtle) multicolored effects on natural fibers. 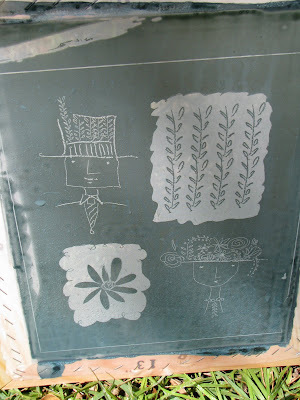 3:00 pm Dye Printing: Silkscreens are fabulous for printing with paint on fabric and paper, but even more versatile when used with thickened dyes. Learn how to build layers of transparent color to create complex, sensuous surface designs. 11:00 am Artistic Embroidery: Go beyond the pattern by combining simple image transfer techniques and hand stitching. Easy methods, intricate original works of art. 2:00 pm OBAMARAMA: Change has come to your wardrobe. Bring your own shirt (or pillowcase, banner, tuxedo jacket, onesie, tea cosy) and have it printed with a cool image of the 44th president! Drop off items by Sunday at 2pm, pick them up after 4pm. 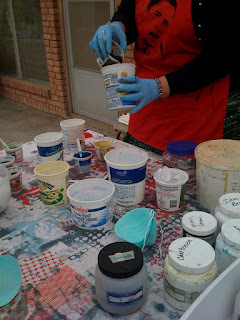 Watch the printathon in action at 2pm! $10 donation. 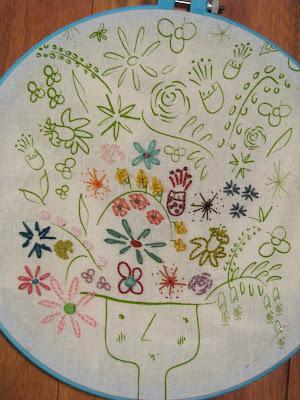 Stitch Niche: Pour some wine, sit on a comfy couch and try your hand at embroidery. We'll have fabric, some instructions, design ideas and plenty of needles loaded up and ready to go. Stamp Making: One time-honored design device is the humble stamp. This hands-on demo will allow you to not only make your own stamps using various materials and techniques, but will get you thinking about mark-making and the nature of pattern and texture. Design Your Own Earrings: Or just play around with hundreds (thousands?) of punched metal circles that will be spread out on a table. All the circles are 1" or smaller and have been punched from decorative containers, so there will be lots of color and even some recognizable images. Design your own earrings (to be assembled and mailed to you later) or just sit and be awed by the sheer craziness of it all. I've been busy lately (what, the lack of blog posts hadn't clued you in already?) so I was very happy to have the opportunity to take a break this weekend and get my craft on with the lovely Future Craft Collective gals. 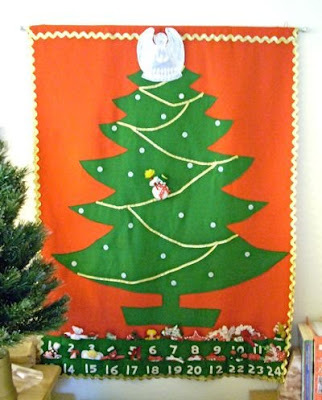 I signed up for their Advent Calendar class as soon as I saw the new schedule, and was very excited to join in. I have a wee obsession with Advent calendars. We have several, and I'm always on the look out for more. I've also always wanted to make one, but have never taken the plunge. That's right, among all the Advent calendars we have, not a single one was made by me. Insanity! Bernadette and Kathie were awesome teachers - just the right amount of guidance and room for a free-for-all. The students were fantastic. I couldn't believe so many of us could fit in the space and make stuff so easily. It was supremely harmonious! I also got to spend some much-needed time with my pal, Jamie, whom I hadn't seen in waaaay too long. It was great to see the different forms each person's calendar took. Some were beautifully traditional, and others were perfectly unique (complete with a He-Man Father Christmas!) It was so much fun to watch us all start with piles of scraps and pieces of burlap and transform them into special family heirlooms. Aside from the crafting, there was also loads of fabulous conversation. Bernadette and Kathie asked all kinds of thoughtful questions about making the holidays a time of family togetherness and of simple pleasures. There was discussion on how - if at all - we discuss things like Santa Clause with our kids. Having these great conversations made working on the projects so much more enjoyable and meaningful. If you're in Austin, you *must* get yourself over to the Future Craft Collective headquarters and get in on one of their classes. I can't recommend them enough! 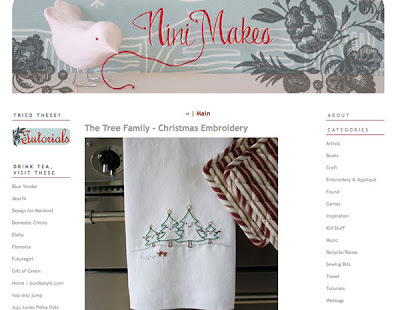 I am really loving this sweet Christmas Tree Family pattern from Nini Makes. I don't have any Christmas tea towels, and I think I'll be stitching this one up so I can use it this year. I commented on her post and just received the PDF by email and it is *adorable*. She's also got a great giveaway with this post so be sure to check it out! You know how much I love embroidery. Quite honestly, learning hand embroidery was the thing that kicked me into crafty high gear and - as geeky as it sounds - really changed my life. 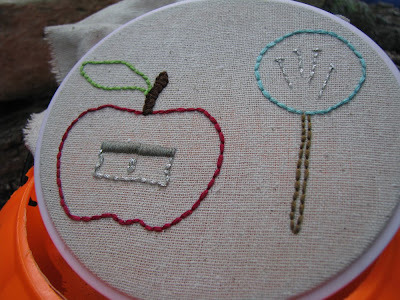 Getting to teach embroidery is one of my greatest pleasures. I've had some awesome students, and we always have a blast in class. 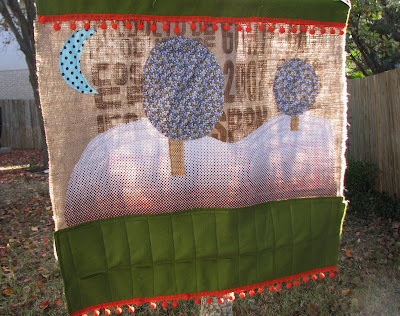 If you'd like to get your stitch on with me, I'm teaching a class next Tuesday night (November 11) from 6:30 - 10:00 PM. 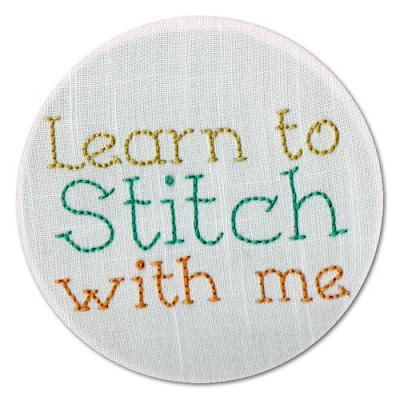 You can enroll through the Stitch Lab web site. I'll be adding more classes soon, so be sure to sign up for the Stitch Lab newsletter, too. Up! Up! Upcycle - and WIN! Want this snazzy Singer "Curvy" sewing machine? Would you like to have a project of yours featured in CRAFT:10 magazine? 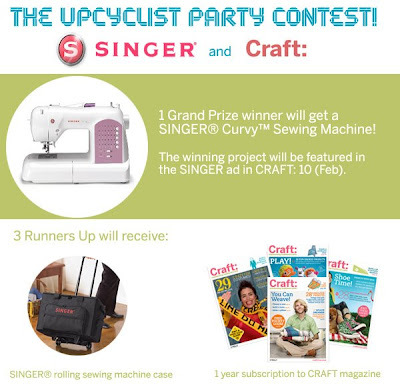 Three runners up will get a Singer rolling machine case and a 1-year subscription to CRAFT magazine! Read more over on the CRAFT blog! A fabulous four-letter word: VOTE! Oy! You are sick of election news, huh? I don't blame you - it can get to be rather mind-numbing. But we're so close. Soooooooo close! This weekend, I received a package from some of my rad Portland pals, Sarah and Josh. 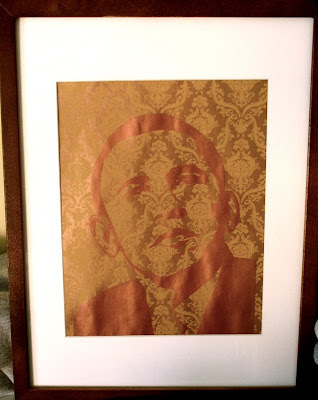 They recently held an Obama screen printing party, inspired by the on the Studio 1408 gals had a couple of months ago. 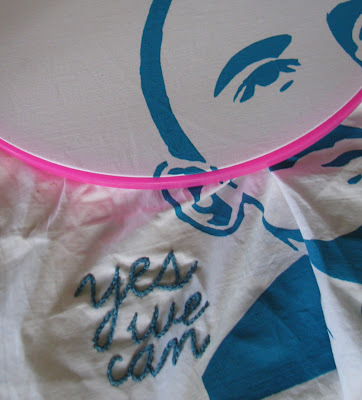 I was over-the-top excited to receive some Sarah/Josh printed Obama goodies this weekend. They sent t-shirts and a gorgeous print on paper, and I was even lucky enough to score a fantastic Obama gocco postcard from Susan. Happy day! Happy day! Thank you, Sarah and Josh. I'll be wearing my shirt as I make "get out the vote" calls from election HQ here in Austin tomrrow! Also, regardless of who you're voting for .... another Portland pal of mine, Lee, has an awesome giveaway over on her blog today. She's put together a great little zine of sorts with a fun knitting pattern, a RAD apalaca applique pattern, a stencil and some mac-n-cheese tips (does this sound like the perfect zine, or what, folks?). You can snag a free copy if you leave a comment on her post and show you've voted. Spread the word! And - if you haven't already - be sure to vote tomorrow. Don't wake up Wednesday morning wishing things were different.